It takes a village … or maybe just a restaurant. 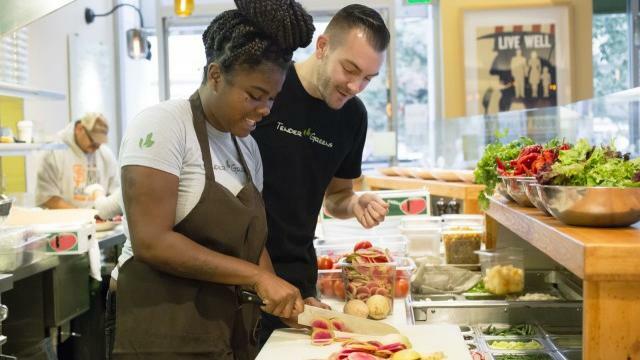 Back in 2009, Tender Greens, a “fine casual” chain based in Culver City, California, began hiring teens who were too old for foster care but far from independence. In 2012, the company launched what it calls the Sustainable Life Project: an internship program for such kids that goes way beyond teaching them to cook. In a six-month stint, interns work in a Tender Greens kitchen, go on field trips to farms, learn how to manage their paycheck, and develop those skills that so many of us take for granted. Most important, they gain a support network of coworker-mentors—as well as, often, a full-time job. Sounds like the true Thanksgiving spirit to us. For more information on the program, go to tendergreens.com.